„The piece Asking Wolfgang was inspired by the Beethoven’s famous and mysterious question „Muß es sein?“ (Must it be?) which he wrote in the manuscript of the last movement of his late String Quartet op. 135, No. 16 in F major. In this quartet he responds to this question himself: „Es muß sein!“ (It must be!). But is it the only possible answer? The Polish composer imagined Beethoven asking this question to his older colleague, Wolfgang Amadeus Mozart. His answer is connected with his greatest opera, „Die Zauberflöte“ („The Magic Flute“), and might be surprising… However, in order to find out, what he responded to Beethoven, you need to listen to the piece. 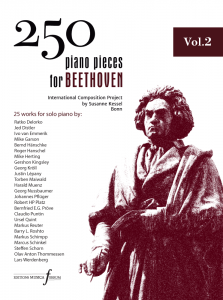 Asking Wolfgang is dedicated to the excellent pianist Susanne Kessel and was written for her wonderful and inspiring project “250 piano pieces for Beethoven”. composer and translator. She graduated in composition (at the Ignacy Jan Paderewski Academy of Music in Poznań, with Prof. Mirosław Bukowski) and applied linguistics. She also studied film music, computer music, and audiovisual creation at Grażyna and Kiejstut Bacewicz Academy of Music in Łódź. She has won prizes in composing competitions in Poland and abroad, including Reinl Preis 2003 (Austria), Suoni di fiaba (Italy), Alfredo Casella (Italy), Vera Passio (Warsaw, Poland), Srebrna szybka (Kraków, Poland), and Fontannie bije ten dzwon (Gdańsk, Poland). Her works have been frequently performed throughout Poland and abroad (in Europe, Vietnam and the USA), including at events such as the World Carillon Congress 2017 (Barcelona, Spain), the Festival of Contemporary Music „Turbulences Sonores“ (Montpellier, France, 2017), the Osmose Festival (Luxemburg and Belgium, 2017), The Festival Sakralnyj Prostir in Lviv (Ukraine, 2015), International Festival of Contemporary Music Poznań Musical Spring (Poland, 2014, 2015, 2017, 2018), International Festival Słuchalnia – Musical Signs of Time in Toruń (Poland, 2015), and the Passion and Passover Music Festival in Poznań (Poland, 2013, 2018). She has received scholarships from the Polish Minister of Culture and Art, Land Brandenburg, and the German Music Council. 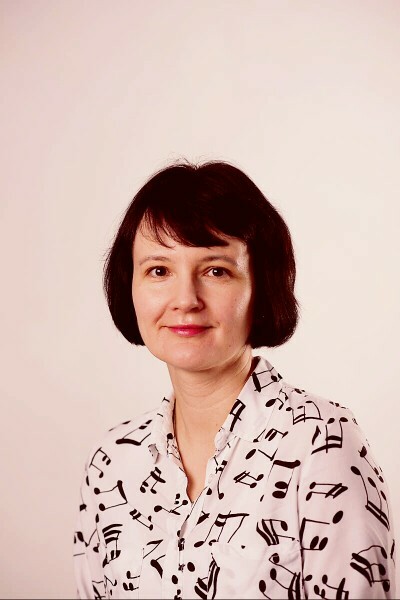 In 2012 she obtained a doctor’s degree in composition for her symphonic work ‘Musica simultanea’ and a dissertation about the connections between music and spoken language. She is particularly interested in connections between the languages and music. She is a member of the Polish Composers’ Union and the Polish Society for Contemporary Music. She is also a translator from German into Polish, in which capacity she cooperates with music publishers and journals. Since 2005 she has been working in the Institute of Music of the University of Zielona Góra. Her works include solo and chamber music, pedagogical pieces, as well as choral, symphonic, and electronic works.